You are gliding on the water. You turn toward the boat’s wake and launch yourself skyward, pulling the handle around your back as you execute a perfect 360. After you nail the landing on the other side of the wake, you flash a “shaka” to your friends in the boat. Then you do it again. This could be you. However, first you need to learn the basics. Wakeboarding took off in the 1980s and since then, has largely displaced waterskiing as a water sport. Why? Wakeboards, with their wide bodies, are much easier to “get up” on than narrow slalom skis, and they provide a great platform for aerial acrobatics. 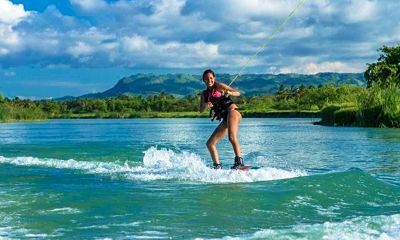 Additionally, wakeboarding requires less speed from the boat, which means riders go slower, and are able to ride longer before their arms get too tired to continue. If you have considered wakeboarding in the past but are intimidated by the learning curve, you should not be. Below are a few tips for the first timers. You will need a wakeboard and boots, of course; a US Coast Guard approved life vest; and a towrope with a handle (sometimes towropes and handles are sold separately). Ideally, your boat will have a tower—a structure that is about eight feet tall that allows the towrope to be connected to the boat. Towers provide two benefits: they make it easier to get out of the water by creating upward pull when you are in the water, and they make it easier to get airborne when you want to. Finally, you need an orange flag—a universal signal that there is a person in the water near your boat. These flags are available at most marinas. Raise the flag whenever a rider is in the water—before you start and when he or she falls or is preparing to get back on the boat. Getting a wakeboard that works for you is relatively simple—they are sized-based on rider weight. Online shops and local shops will have size charts for every board. Boots are sold separately and can get quite pricey. The cheaper ones are “one size fits all” and have Velcro straps that can come loose in the water. Laced boots that can be adjusted and kept tightly laced with a clasp work better, if you can afford them. You can get boots for your exact foot size (size 6, 7, 8, etc.) or that fit a range of foot sizes (7-9, 10-12, etc.). Make sure your feet will be good and snug. If you do not have boots or a board, you can always rent them. This way you can test the sizes until you find the perfect fit. Most boats have a swim platform on the rear end, which is a place where you can sit and put the board on your feet. Sit close enough to the edge so that you can pull your feet up and rest the board on the swim platform, and once the board is on, extend your legs into the water. Getting into the water on a wakeboard can be awkward. Wiggle your way off the swim platform. Putting boots on in the water is not recommended, especially for beginners. If you have a hard time getting your foot in the boot, try a little squirt of biodegradable dish soap. Wakeboard shops also sell a special goo to help your feet slide in. One reason many people do not try wakeboarding (or waterskiing, for that matter) is because they do not want to look foolish or they think it will be an imposition on the rest of the folks in the boat to spend time learning. In reality, we have all been there. Your captain and crew are likely to be very patient and give you lots of encouragement and advice. Everyone was in the water, hoping to miraculously rise above the water the first time. So relax and enjoy the experience. Here are a few tips and tricks to “standing up” on your wakeboard. Keep the board perpendicular to the water surface. When you get ready to get up, your board should almost be at a 90 degree angle to the surface of the water. Pull your knees in. Many people call it “the ball”—bring your knees into your chest, in a near fetal position. Keep your arms straight. Tip your toes forward. If you hold the board exactly perpendicular to the water, when the boat accelerates to pull you up, the force of the board against the water will be too great and you will push a bunch of water until you cannot hold onto the handle any longer. Tipping your toes forward creates space for water to rush under the board and lift you up! Stay in "the ball." Stay hunched as you are rising up. As you gain confidence that you are indeed out of the water and gliding above it, slowly stand up. Lean back – but not too far. That may sound contradictory but there are two things that are taking place that could foil your attempt to wakeboard once you are out of the water—leaning to far forward or too far back. Back is better, as you have a nearly 400 horsepower engine pulling you forward. Most people lurch forward with the force of the boat and fall. So lean back gently and you will be ok.
Once you are up, try to stay behind the boat until you get a feel for how to move to your left and right. Keep your weight on your back foot. It is your steering wheel or, more accurately, your rudder. Weight on your back foot allows you to control where you go and gives you greater stability. If you put too much weight on your front foot, you will zoom off or, worse, “face plant,”,if the front edge of the board goes underwater. If you keep these tips in mind, you will be a wake jumping hero! It may take you one try, or it may take you four or five tries. Don’t worry about it. Remember to just relax. It’s supposed to be fun!